A huge boulder that will become part of an art installation at the Los Angeles County Museum of Art begins its 11-day journey tonight from a quarry in Riverside County. The 340-ton, 22-feet-tall stone’s slow ride across Southern California will block several lanes of traffic in Diamond Bar, Rowland and Hacienda Heights. 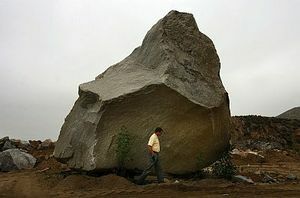 The megalith will become part of Michael Heizer’s work “Levitated Mass” after it is cantilevered onto a 456-foot-long concrete slot on the grounds of the museum at 5905 Wilshire Blvd. It is expected to reach the museum in the early morning hours of March 10, museum officials said. Before it becomes art, museum officials expect the massive boulder to attract plenty of spectators during the daytime, as it sits parked along the 105-mile route. The rock, being transported by a specially designed wide-load trailer, will park in Diamond Bar at Chino Avenue, just east of Chino Hills Parkway around 4 a.m. Friday and stay there the entire day, according to museum and city officials. After a stop in Diamond Bar, the rock’s journey resumes in a westerly direction on Pathfinder Road into Rowland Heights around 11 p.m. Friday. A weekend stopover is planned at Buttonwood Lane and Pathfinder in Rowland Heights for the third and fourth day of the journey, on Saturday and Sunday, according to Carroll. It will not travel on Saturday night. From there, the rock’s route continues along Colima Road in Hacienda Heights to La Mirada Boulevard. Read more in Steve Scauzillo’s story ROCK. The American Red Cross will offer a community disaster preparedness program on Saturday, March 3, from 2 to 3 p.m. in the Rowland Heights Library. They will teach skills needed by families and communities in an emergency. This free program is open to adults, seniors, teens and families. The library is at 1850 Nogales St., Rowland Heights. For information, call 626-912-5348. Diamond Bar residents toured their new city hall on Tuesday afternoon during an open house that celebrated the first time the city has had its own building in its 22-year history. Diamond Bar’s new City Hall officially opened for business last month. The city bought the building at 21810 Copley Drive in September 2010 with the dual goal of addressing space needs for city operations and creating a new home for the nearly 40-year-old library branch. See our photo gallery at CITY. Diamond Bar residents are invited to take a tour of Diamond Bar’s brand new city hall, today from 4 to 6 p.m. It officially opened for business last month. The opening marked the first time in its 22-year history that the city is operating from its own building. Employees formally worked out of a South Coast Air Quality Management District complex that the city shared with the agency. Diamond Bar purchased its new building at 21810 Copley Drive in September 2010 with the dual goal of addressing space needs for city operations and creating a new home for the nearly 40-year-old library branch. The building’s first floor and future library site will not be open for tours Tuesday because it is still under construction. Completion is planned for this summer. With 27,000 square feet of space, the second floor houses all city government service functions, a team of Los Angeles County Sheriff’s Department personnel and an Emergency Operations Center. It also features a large public service counter and several meeting rooms. City Hall’s open house will take place from 4 to 6:30 p.m. For more information, contact Diamond Bar’s public information office at 909-839-7055. Cities and businesses in the East San Gabriel Valley are lining up with the city of Ontario in its effort to wrest control of Ontario International Airport away from the city of Los Angeles. In the last few weeks, Diamond Bar and Walnut city councils have all passed strongly worded resolutions in support of Ontario gaining possession of the regional airport often used by San Gabriel Valley residents and businesses. Shelyn Elementary in Rowland Heights is raising money for the Leukemia and Lymphoma Society through Pennies for Patients this month. Last year, they raised $2500 and Mrs. Ruud dyed her hair green. This year she challenged the students to raise $5,000 and she’ll shave her head. If the students reach $3000 Principal Sarah Opatkiewicz promised to show the love and get a big hot pink streak through her hair. “We are currently at $1,211 after only one week! I’m worried!” the principal said in an email. To help raise more money, the school is holding a “Show the Love” event today at lunch, when students can buy a yard of duct tape for $1 and stick the principal to the wall. “Our character traits this month are empathy and kindness, so we’re hoping this will help build our students’ spirits of giving back,” she explained. The Kiwanis Club of Hacienda Heights and the surrounding community have a big heart. They gave 125 children an early Valentine’s Day gift – a new pair of shoes, socks and a goodie bag with a book to take home on Feb. 10. The elementary children came from schools across the Rowland Unified School District. The students from La Puente, West Covina and Rowland Heights were pre-selected based on need. 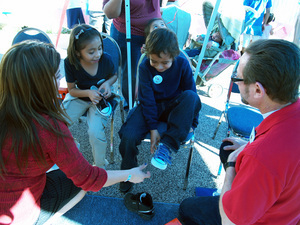 The Heart and Sole event took place at the district’s Family Resource Center in La Puente. “It has been very gratifying and so much fun picking out the shoes for this event,” said Dave Malkin, Kiwanis Club member and organizer of the event. The Good Time Travel Club at Steinmetz Senior Center in Hacienda Heights will visit the Reagan Presidential Library on Thursday, Feb. 23. The cost is $32 for members and $42 nonmembers. A buffet lunch will be served under the wing of Air Force One at 11:30 a.m. The bus will leave at 9:30 a.m. and return at 6 p.m. The center is at 1545 S. Stimson Ave. For information, call 626-934-7041. In a few months, dog owners in this town won’t have to go to Fullerton or San Dimas to let their dogs roam free. The city of Diamond Bar is planning a 1.35-acre dog park of its own in a corner of Pantera Park, an existing 23-acre sports park east of Diamond Bar Boulevard and west of Chino Hills Parkway. The off-leash dog park is in the final planning stages and will come before the City Council on March 20 for final approval, according to the city’s community services director Bob Rose. Read more in Steve Scauzillo’s story DOG.